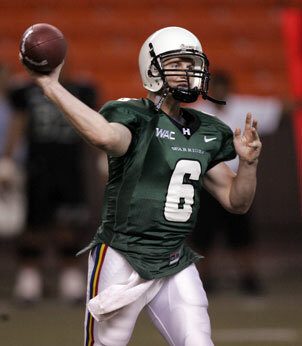 Returning Warriors Tyler Graunke, pictured, and Inoke Funaki are the frontrunners to replace recordbreaking quarterback Colt Brennan, but one of the transfers arriving in August could wind up winning the job. The first play of the inaugural Warrior Bowl was some kind of underhanded pass from Inoke Funaki to Daniel Libre that went for 8 yards. It wasn't as esthetically pleasing as those Colt Brennan once threw to Davone Bess and Co., but last night's spring game was a reminder that it's time to move on. As magical as last year was for the University of Hawaii football team, this upcoming campaign is only 125 days away and there isn't anybody expecting another 12-0 regular season. In fact, breaking even will be challenging enough when considering Hawaii has road games with Florida, Oregon State, Boise State and Fresno State that would have been difficult to negotiate even with last year's team. With the offense rebuilding, a lot has been made of how good the Warriors defense will be, led by arguably the best linebacker trio in the Western Athletic Conference in Adam Leonard, Solomon Elimimian and Blaze Soares. The offense has some serious holes to fill, including a retooled line that is facing quality competition the opening month of the season. Just who will step in for Brennan under center is open to debate, with the possibility of a junior college prospect ultimately winning the job. Funaki and Tyler Graunke had their moments in last night's game that featured a running clock. Funaki got off to a hot start, completing seven of nine for 102 yards and a touchdown in the opening quarter. As a result, the Black team took an early 10-0 lead, but the Green got back in it as Graunke overcame an early interception to lead his team on a scoring drive in the second quarter that culminated with an 8-yard TD strike to Mike Washington. You have to figure both QBs will see a lot of playing time this season. USUALLY, THE defense dominates in these affairs, but a base package was used last night, giving the offense a chance to shine. The secondary looked a little shaky, minus Ryan Mouton and Keao Monteilh, who didn't play. Too often wide receivers were wide open, giving one pause considering the challenges that await. One thing new head coach Greg McMackin has seized upon is the popularity this team generated last season. There was a sizable crowd of about 10,000 that saw two well-prepared squads. Granted, there were a few false starts, a couple of bad drops and some coverage issues, but Funaki and Graunke acquitted themselves well in a game won by the Black, 24-20. Ron Lee beat his brother, Cal, in their spring football head coaching debut. Cal took it hard, agreeing that at the 2-minute mark of both halves, a normal clock should have been used to provide a little more excitement. But it was a good finish for McMackin, who has some difficult choices about who stays and who goes as he prepares for the incoming recruits and fall camp. "We've had a whirlwind few months, but it's been great," McMackin said. "The base has been built, Everybody has been so supportive. It was a great turnout tonight that these guys appreciate. They've worked hard this spring to improve. I'm the appreciative one because this has been a blessing to me." McMackin has done well his first 100 days in office. He has taken what June Jones left him and built a respectable foundation for the future. Just don't expect any miracles. The difficult schedule will make it hard for the Warriors to achieve their goals, but judging by last night's performance, they took a big step in the right direction this spring.